So, I lied in an earlier post. These were actually my first drawings of the year. 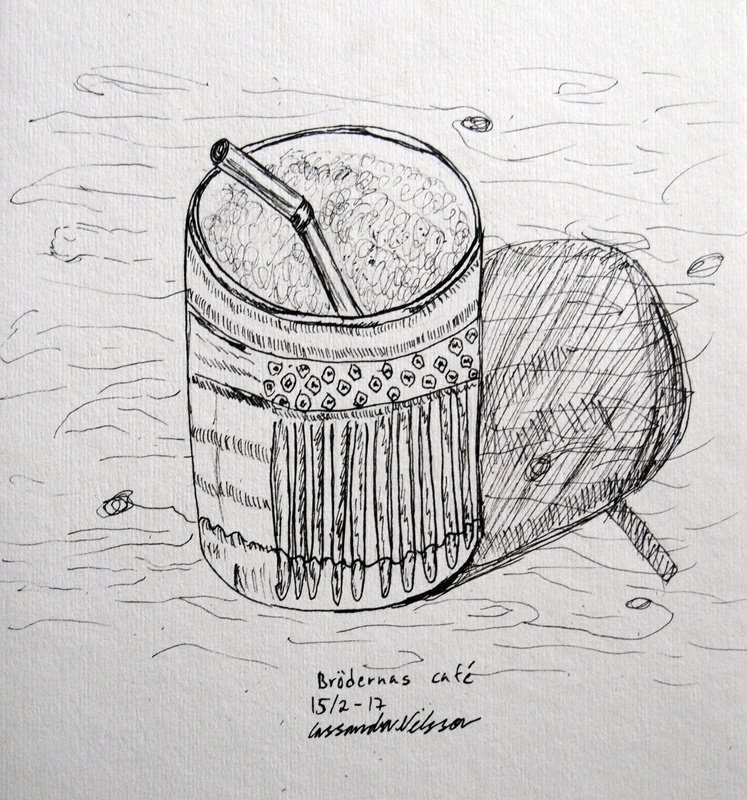 I did them both during a sketching session at Brödernas café. I was really rusty when I tried to draw my chai latte. There’s very things I’m happy with. I do like the straw, though. That’s the only part that turned out well. 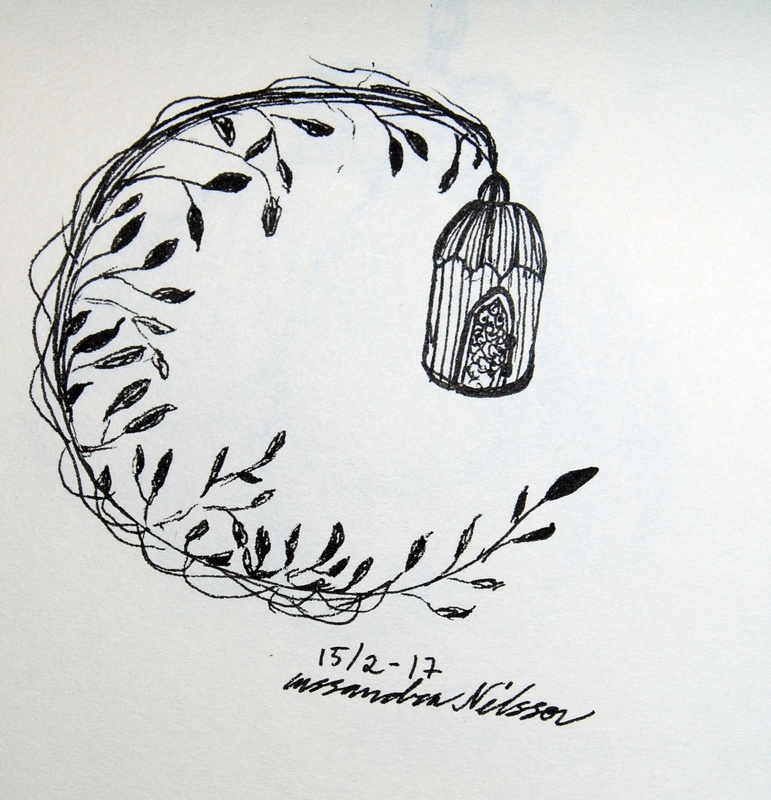 Then I did this doodle of a lantern, which I think turned out rather well. 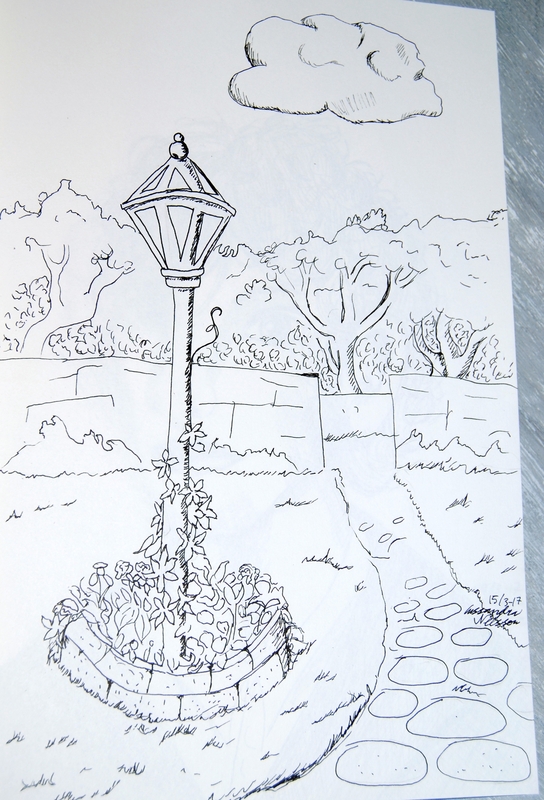 I like the circular shape, the open space next to the lantern, and the organic feel of the leaves. We carpooled to the neighbour town to sketch their old town. It was freezing, so I spent the first hour just touristing before I forced myself to sit down and get some sketching done. It was a first for me to draw with gloves on and I think that’s why the sketch ended up so lopsided. 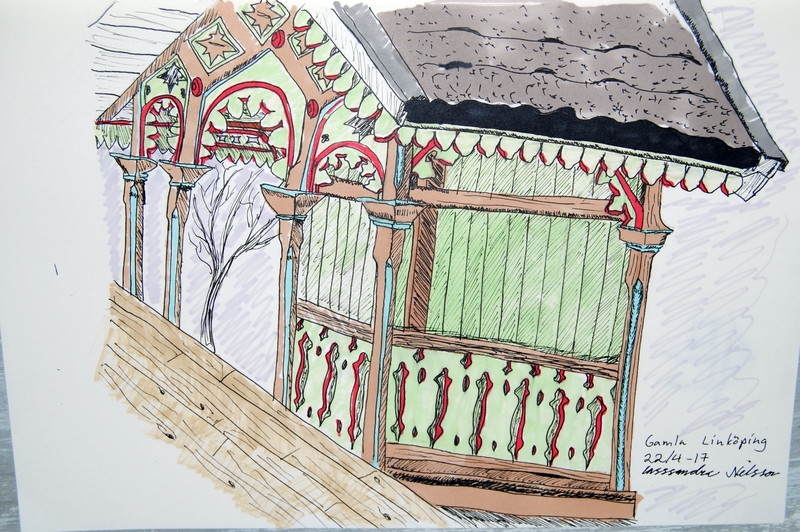 This was a charming pavillion belonging to one of the cafés, and I just had to colour because I loved the combination of green and red. 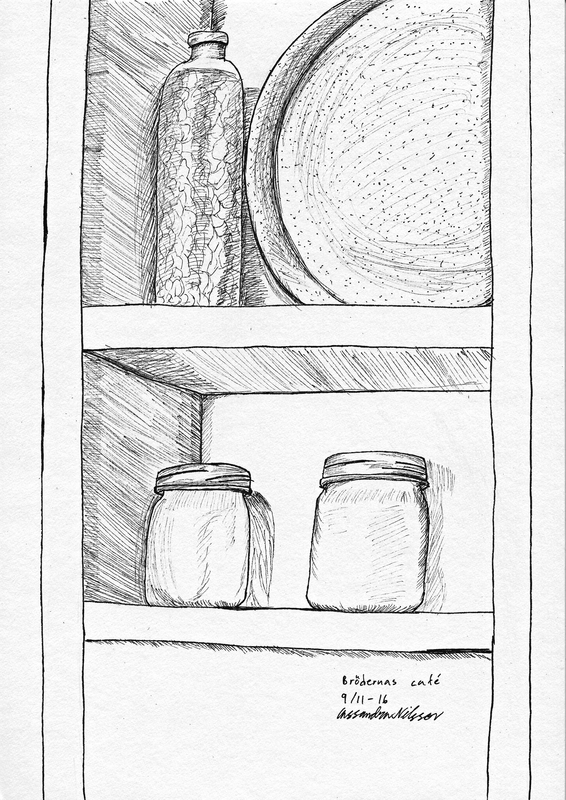 This drawing is from the same session as the Christmas tree. Feeling a bit discouraged, I went up to where the rest of the group was sitting and ordered a chai latte and a lussekatt. 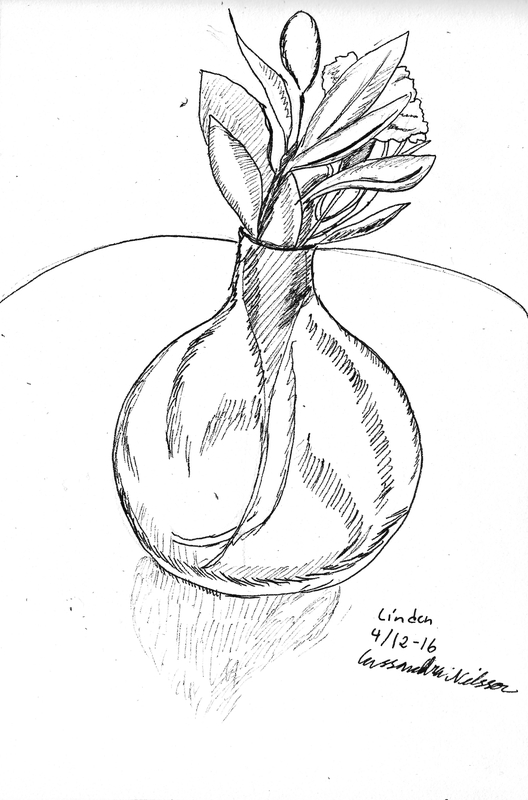 While eating, I sketched the vase on the table and felt a little better. Quick and easy. It turned out quite cute. We went back for a final session at the City Museum. This time I visited the upper floor, which had this exhibition about how Norrköping the city came to be. Wax figures showed off the history of city. 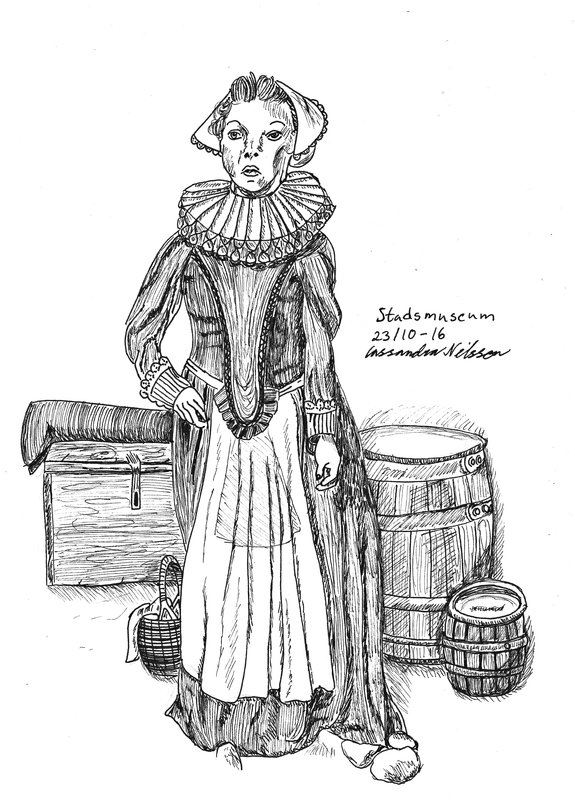 One of the figures portrayed Adrienne De Geer, spouse of Louis De Geer – known as the father of Swedish industry. She’s a stern-looking, haughty lady. I have no idea why she was surrounded by a chest, barrels or a basket, but for some reason she was. Maybe I should have read the exhibition text as well as drawing? 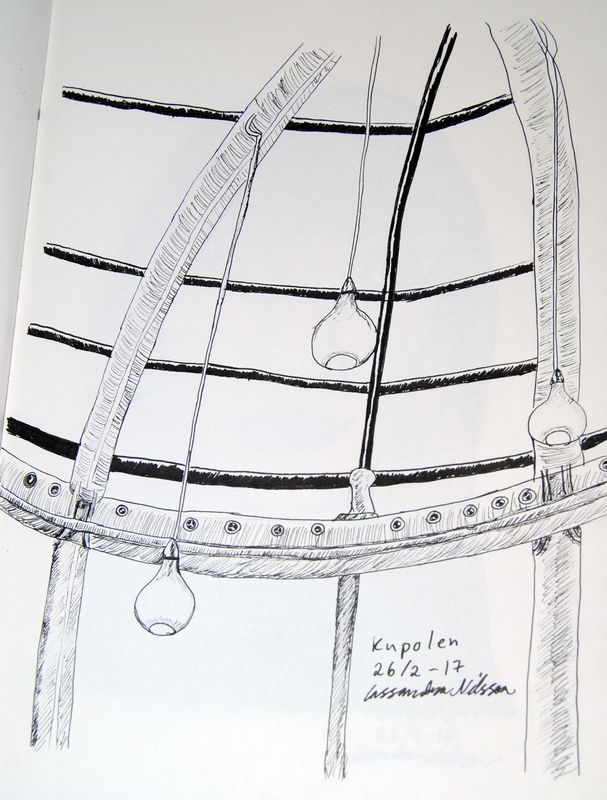 The Urban Sketchers group took a trip to the local City Museum. Free of entry and with these cool little scenes showing off the city’s industrial heritage. 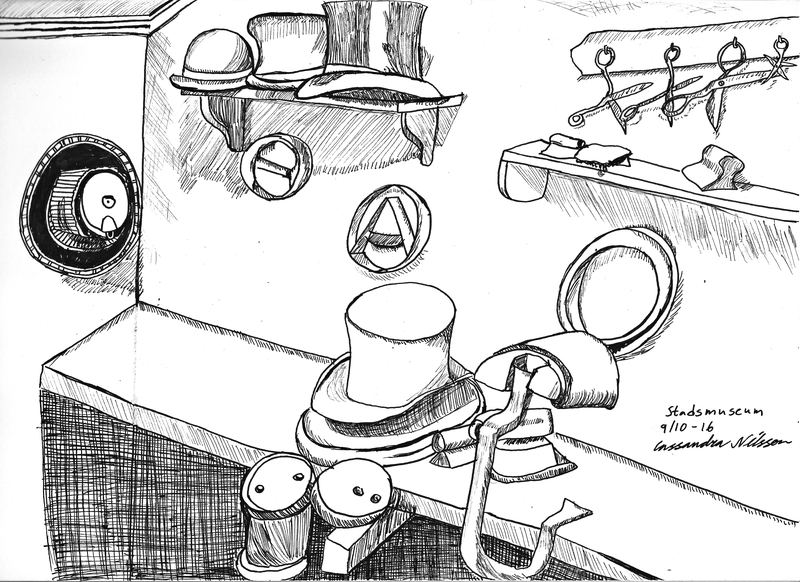 It was difficult to pick what to draw, but I did finally pick this hat-makers’ window. I think I made so many poor choices with this one, but there are parts I like. For instance, conveying the shapes of the different part of equiptment. I have no idea what most of them were, though. I just thought they looked cool. I like how the hat end up the focus point. But I need to either bring a ruler to these events or learn how to draw straight lines! Another Sunday and we went to the sea. It also coincided with the second day of Inktober, so this is my drawing for that event as well. I went at it again and attempted to draw a building. Practice makes perfect after all, and just because I’m really bad at it doesn’t mean I should give up. Even if the perspective is off, I still like this picture. There’s a charm in it. I think I managed to capture just how cute this restaurant is, and I’m rather happy with the middle part of the drawing. The shadowing and hatching are quite nice. There’ll probably be more perspective-defying drawings of houses from me for a while now, to see if I can improve matters. Another Sunday, another meet with the Urban Sketchers group. This time we went to harbour. Or rather, the industrial harbour, as there are couple of others as well. 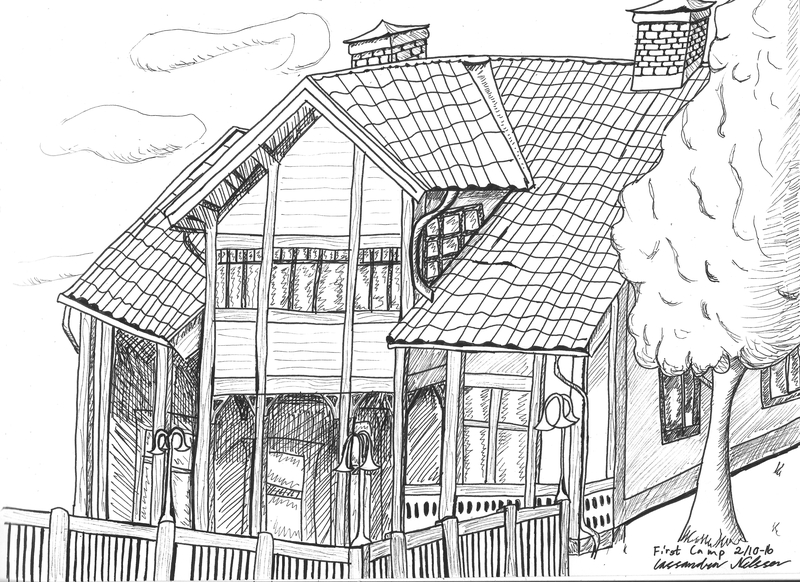 This is my first “urban” drawing for the group and if I’m going to draw houses, I’m bringing a ruler. I’m not very happy with this sketch, as it looks rather cartoony due to perspective failure. There’s a bit of disconnect in my head, because it doesn’t look like one of my drawings and I just simply don’t like it. Most of the time. Other times I look at it and think it’s a bit cute. I like the shadowing on the truck in the foreground. 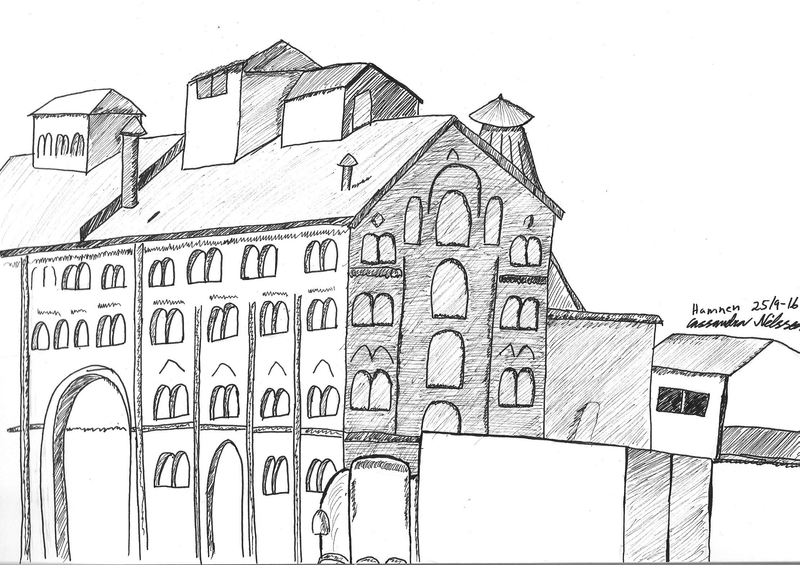 But clearly I need to practise drawing buildings more.